Comic-Con banners in Balboa Park’s Federal Building! – Cool San Diego Sights! Comic-Con banners in Balboa Park’s Federal Building! Comic-Con banners have been hung inside the Federal Building in Balboa Park, former home to the Hall of Champions, and future home to the Comic-Con Center for Popular Culture! Look what I spied today! Being tall, I peered over a partition that runs along the perimeter of the old Hall of Champions lobby, and look what I saw! 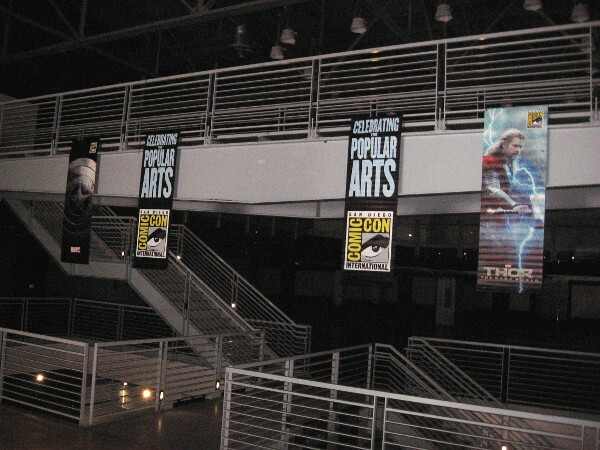 Several Comic-Con banners have recently been hung inside the building! According to what I’ve read, the Comic-Con Center for Popular Culture will open in 2019, but funds still need to be raised. It’s my understanding that sales of the exclusive Comic-Con 2018 Mondo print will be part of the fundraising effort. I don’t know if an event of some kind will be held in the Federal Building during 2018 Comic-Con. Whatever the reason for the recent appearance of Comic-Con banners–it’s definitely a cool sight that got me excited! If you’d like to see what the Hall of Champions looked like just before it closed, click here. In early 2019, during an event at the site of the future Comic-Con Museum, I learned the finished museum is scheduled to open in May 2021! Previous Previous post: Fun photos for those who love Star Wars! Next Next post: Medieval knights mock fight in Balboa Park!